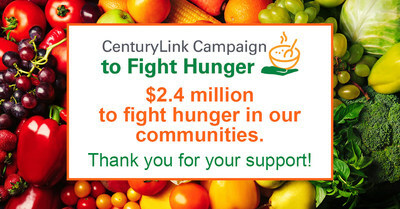 MONROE, La., June 21, 2018 /PRNewswire/ -- CenturyLink, Inc. (NYSE: CTL) announces its 10th annual food drive has raised over $2.4 million to fight hunger in communities where the company operates. These donations are the result of generous contributions from employees and community members, and a matching pledge from the CenturyLink Clarke M. Williams Foundation. The CenturyLink Campaign to Fight Hunger, a two-week online food drive that ended June 15, benefits over 140 food banks located in communities the company serves across the U.S. and abroad. Total donations to the campaign ($1.4 million) were matched up to $1 million by the CenturyLink Clarke M. Williams Foundation. "CenturyLink is proud to partner with so many food banks in the ongoing fight against hunger," said Sondra Smith, director of corporate social responsibility. "In addition to providing meals for families and individuals in need, we want to raise awareness of hunger and the painstaking year-round efforts that food banks undertake to address this need in their communities." Since its inception in 2009, donations from CenturyLink's annual food drive have provided the equivalent of more than 80 million meals to local food banks in the company's operating areas. The CenturyLink Clarke M. Williams Foundation matching funds will be distributed to participating food banks based on the dollar amount of donations directed to them through the campaign's online donation site. According to Feeding America, the nation's largest hunger relief organization, nearly 13 million children and more than 50 million seniors face hunger in the U.S. Action Against Hunger says one in nine people worldwide do not get enough food.